Cheesy Fritos chili pie is a classic Tex-Mex dish that's still as enjoyable today as it was when you were 10 years old. 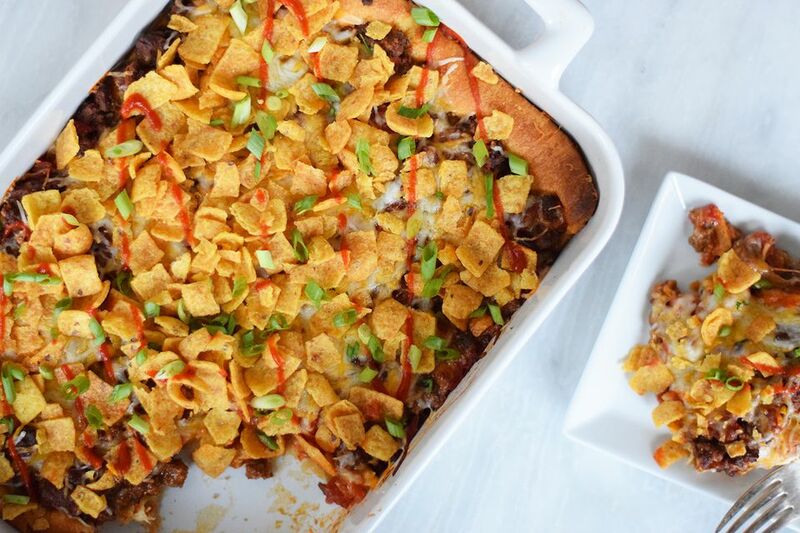 The casserole is packed with chili, shredded cheese, and crushed Fritos... what could be better? Its crust is also made out of crescent roll dough, making it one epic dish for dinner or Super Bowl parties. To elevate the dish, use a homemade chili that simmers for an hour and top with beautiful sliced green onions. However, you can also use a packet of taco seasoning and plain old ground beef if you're in a rush to get this meal on the table. Cook until browned and skip the hour simmer for a quick meal that kids and adults alike will crave more of. Heat a large skillet or dutch oven on medium high heat. Add the ground beef and garlic to the pan. Cook until the meat has browned completely. Use a spatula to crumble the meat as it cooks. Add the tomato sauce and spices to the cooked ground beef. Stir until combined. Add 1/4 cup of water. Turn the heat down to low, cover, and simmer for 1 hour. You can cook for less time if you are in a rush, but the flavor is best when cooked for an hour. Add the masa flour to the chili along with the can of diced tomatoes. Stir until combined and remove from the heat. Preheat the oven to 375 F.
Press the crescent roll dough into the bottom of a 9x13-inch baking dish. Make sure there are no gaps from the perforated lines. Press the dough up about a 1/4-inch on the sides of the baking dish. Mix in 1/2 cup of the shredded cheese into the cooked chili. Pour the chili mixture over the crescent roll dough inside the baking dish. Place in the oven and bake for 20 minutes, until the center is bubbly and the edges are lightly browned. Top the casserole with the remaining shredded cheese and drizzle with the taco sauce. Bake for another 5 minutes, or until the cheese has melted. Remove the casserole from the oven and sprinkle with the crushed Fritos chips and the sliced green onion. Slice into squares and serve immediately! Masa flour can be found in most grocery stores in the International Foods aisle. It can also be omitted if you cannot find it. Add in the kidney beans, diced onions, or jalapenos for different variations on the classic filling.